We help our members communicate important stories about their utilities and communities. Whether you’re trying to communicate an outage or a safety tip, getting your message to your customers is important. That’s where we come in. Think of us as your marketing communications and advertising agency–we’re here to help with developing a brand strategy that could include anything from creating a logo to designing a website so that your message is received by the right people. We’ll create a campaign that includes a logo, branded promotional items, a press release, and a resolution template for members to use at local events. We supply bill inserts, posters, and videos that help communicate the value of public power and educate public power customers on energy efficiency and safety tips. A bulk of our advertising services are included as part of your ElectriCities membership. If you need additional assistance with a campaign that exceeds the normal scope of work, we have the following options to help offset the cost. The amount each member is eligible to receive depends on the number of customers in the community. We complete six of these projects each year to help our Power Agency members create long-term impact for their utility and/or city. This program provides funds to help our Power Agency members promote their utilities and their communities. Let us know if you would like ElectriCities to sponsor your upcoming event. We’re here to help you establish and maintain a brand that will resonate with your customers. What defines a brand? A brand is much more than just a logo, color palette and tagline. Brand identity—your identity—is built on a strong foundation of your promise to your customers, personality and an overall platform. Take a look at how we have helped out our member communities throughout the years. 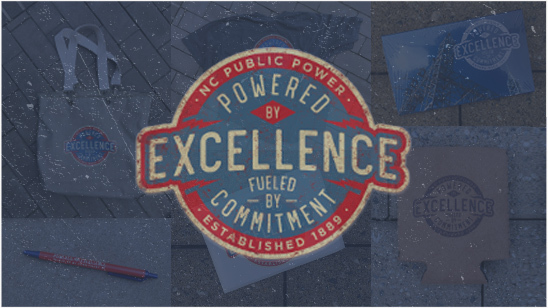 Since 1965, ElectriCities of North Carolina has been the energy behind public power, partnering with our valued members throughout the state to provide safe, reliable power to 1.2 million people across North Carolina. Our know-how, resources and expertise are part and parcel of how we have been able to deliver superior service to that end, day in and day out, for more than 50 years. One of our goals as an organization is to take the time to shine a light on the fine folks who make delivery of that superior service possible. We value and appreciate all the great work ElectriCities does on behalf of its members! The corporate communications team is especially important to the smaller members.